The Discovery process of working with a new client typically lasts about three months. We are more than 2/3 there with HydroComp Inc., the Make Your Marketing Matter contest winner (the prize was a year of free marketing services from Savoir Faire). Information Architecture is the process of figuring out what type of information the site will require and how it will be organized. We’re answering the big question, What will this audience be searching for? We approach this challenge like a game of 3D tic-tac-toe, where you are looking at multiple layers in order to develop an organized website that is intuitive to users. We also want the site’s functionality to be scalable, so we are able to add new elements over time if needed, such as additional products, services, industries or markets. Information Architecture leads us to the navigation and the taxonomy, how we classify everything on the site. Wireframes are the first tool to begin visualizing the website in a low-fidelity manner. Think of them as the skeleton or blueprint of a web page. Typically, there are no colors, fonts, images or other visual elements at this phase. 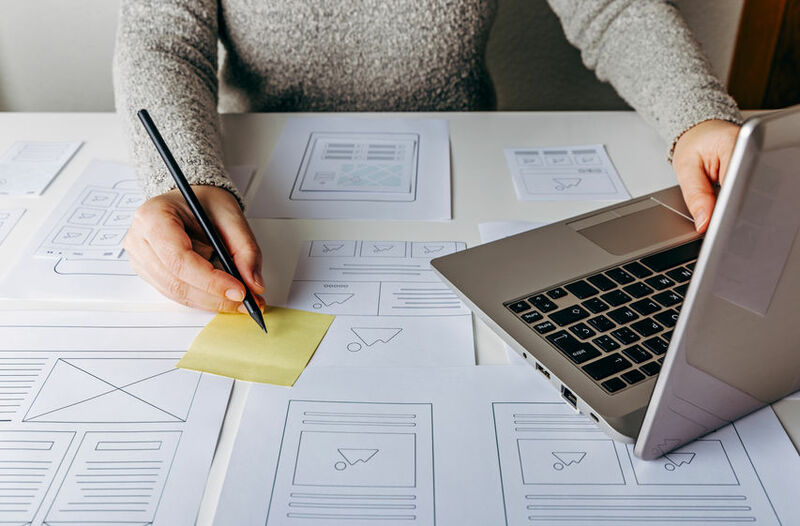 Wireframes are a tool to show page structure or structure for various types of pages in a website (home, contact, products), so we can look at basic functionality, such as content areas, headers, buttons or image areas, without being distracted by design and content. We want a client to look at their website at this point with horse blinders or tunnel vision. It’s so easy to get caught up in content and design at this stage, but we can’t go down those rabbit holes just yet. Wireframes allow us to take the process one step at a time and help us focus our clients’ attention where we want it: Functionality now, design later. We use a website navigation map and wireframes together to give a client an overview of what pages the new site will contain and their hierarchy. It’s a great opportunity to look at what may be missing – and to ask a lot of questions. Wireframes also give the content creation team some guidance on developing the content, as there are placeholders for content areas, graphics, and more. They also assist the site designers by providing a conceptual roadmap to follow. All of these elements continue building the foundation for the site and the overall marketing plan. We are presenting our technical documents, including the wireframes, to HydroComp this month and the results of that meeting will be presented in the next blog post. Stay tuned!